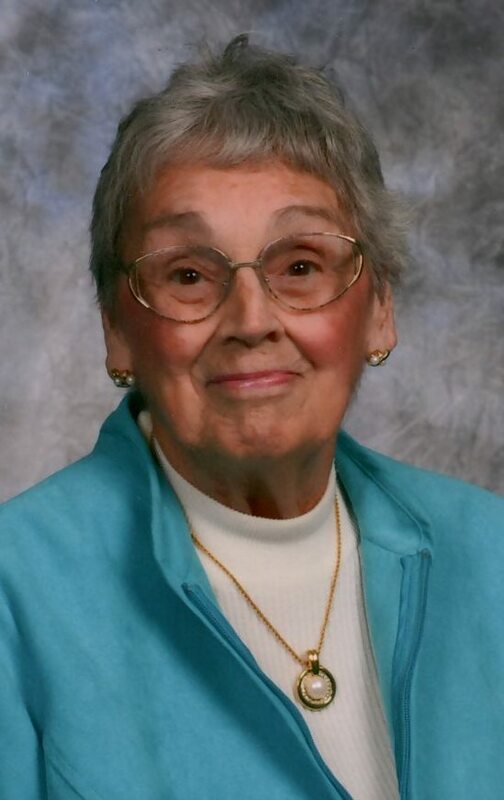 Phyllis J. Oman, 92, lifelong resident of Richwood, died peacefully early Saturday morning March 16, 2019 at the Memorial Gables in Marysville. She was born November 11, 1926 in Richwood to the late Sturgis and Gladys (Flesher) Cheney, she was also preceded in death by her husband, Glenn E. Oman, they were married August 25, 1946 at the Richwood First United Methodist Church and he died December 10, 1981. Also preceding her in death was one daughter: Janise Sue Oman, her siblings: John, Gene and Robert Cheney, Carolyn Cheney and Sara Shields. Phyllis was a 1944 graduate of the Richwood High School. She was a devoted lifetime member of the Richwood First United Methodist Church, where she served the church in many capacities including Sunday School teacher. In 1968 Phyllis began working with Dr. Pete Drake as he founded the Ohio Quarter Horse Assn. in Richwood. She continued to work there until she was well into her 70s. Phyllis was a devoted wife and mother, she enjoyed her many years on the farm, where she took great pride in her large garden and spent many hours creating delicious meals for her family. In earlier years, Phyllis belonged to the Mother’s Club, and the Eastern Star. She loved being with her friends and neighbors. When she was able, she was a constant presence at many of the North Union athletic events. She was a member of the Richwood Civic Center, where she spent many hours volunteering. Phyllis enjoyed playing Bridge and euchre. Surviving are her children: Trudy Berry of Cedar Rapids, Iowa, Robert (Dolores) Oman of Delaware, Jill Morgan of Dayton, James Oman of Atlanta, Georgia and David (Pam) Oman of Kannapolis, N.C.
14 great grandchildren and many nieces, nephews and cousins. Funeral services will be held Friday March 22, 2019 at 11:00 am at the Richwood First United Methodist Church, Pastor Joseph Rhea will officiate, burial will follow In the Claibourne Cemetery. Friends may call Thursday from 4-7 pm at the Stofcheck-Ballinger Funeral Home in Richwood. Bob and your entire family,so sorry for your loss. Our thoughts and prayers go out to each and everyone. I am so sorry do the loss of your mother. What a dear friend she was to so many, many of us. I will miss her smiling face but know she is at peace with her heavenly family. My love to you all. I’m so sorry for your loss. My prayers are with you. Condolences to you and the family. We wish we could attend on Saturday to support you in friendship and love. We will be there in spirit. Jill and family, condolences on the loss of your mom. I remember her well from school and church activities. Prayers for your family's loss of your mother! She was so kind and had that beautiful smile. She will be missed! So sorry to hear the loss of your Mother. She always had a smile. Just remember all the good times. We're so sorry for your loss. My parents, Paul(Gene) and Joanne Tevis enjoyed Phyllis when she would spend the winters at Lake Wales. Sending our prayers. Phyllis was a great neighbor to my parents on Edgewood Drive. So sorry for your loss. Prayers. Sue Cramer Clem. I am so sorry to hear of your Mother’s passing. She always had a smile and conversation for anyone she saw. Please know you are in my prayers. To the family of Phyllis, I am so sorry for your loss. I enjoyed the times shared with her at the Civic Center. She was always so positive and her smile was contagious. She will be missed. May God give you strength at this difficult time. So very sorry for your loss of your Mom..prayers for your family. Your family is in our thoughts as you grieve the loss of your Mother. I don't ever remember seeing Phyllis when she wasn't smiling. Her kindhearted spirit lives on in the family she leaves behind. Russ and Eileen Arbuckle and employees of WCLE wish to express sincerest condolences and prayers for your family during the loss of your loved one. So sorry to hear of your mom's passing. Always enjoyed talking to her. She always had a big smile and enjoyed life. Cherish your memories! Phyllis was such a delightful lady. Loved her laugh. She will be missed by so many. So sorry for your loss. Richard and I enjoyed playing euchre with Phyllis at the Civic Center. We have always known her and all the family. She was a happy, friendly lady full of fun. She will be missed. Our sympathy to all you Omans. So very sorry to hear about Phyliss. She was a very lovely lady and always enjoyed talking to hear. my sympathy to the family. My deepest condolences to the family. Phyllis was a wonderful person and will be missed by so many. A great lady and family who has opened their home to many— keep her memory alive. Our sympathy in the loss of Phyllis. We always had such a good time when she visited us in Florida. May your hearts be filled with wonderful memories of joyful times together as you celebrate a life well lived. My condolences to the family! Phyllis was loved by so many! She will be missed but remembered for so much more..,, loved her dearly! I'm truly sorry for your loss. The girls and I enjoyed visiting with Phyllis. She always greeted us with her big smile. She spoke of her family with such joy and pride. My thoughts and prayers are with you. Sending our thoughts and prayers to the family. Phyllis was a wonderful woman and we will all miss her. Phyllis was such a sweet lady. She will certainly be missed. I'm so sorry to hear that Aunt Phyllis has passed away but comforted to know she is in a better place. I will always remember how she made us always feel so welcome when we came to visit at the farm and will miss her full-bodied and very contagious laugh! You are all in my prayers and I'm wishing you peace and comfort at this difficult time. Dave and family. Our thoughts and prayers are with you and your family during this time. What a wonderful person your mom was and she did so many great things! Perhaps the greatest of all was raising 5 incredible children. Love and prayers are with your family at this difficult time. She was a wonderful, caring and loving person. Cherish the wonderful memories. I have known Phyllis for more than 80 years. I first knew her as my friend John Cheney's older sister. I remember her being a presence around the Cheney home on East Blagrove Street . It was always a pleasure to see Phyllis when I would be back in Richwood. I enjoyed Euchre games with her. What I will remember most about Phyllis is that I never saw her without a smile on her face. She was a treasure. Jill, I am so sorry for your loss. I remember many happy times at your house. Sympathies to your entire family. So sorry for your family's loss. Thinking of you all during this difficult time. What a beautiful lady inside and out. I’m so sorry for your loss. Sending you all hugs . To all of the Oman family, May God wrap His loving arms around each one who loved Phyllis so very much and give you comfort, peace, love, hope, strength, sunshine, calmness, and be with each and every one of you. Phyllis was such a wonderful friend and blessed so many people. Praying for your whole family! God Bless! I am so sorry for your loss. She was a wonderful lady. I ran in to her every once in awhile in Richwood. Sometimes at the funeral home and the Alumni Banquet. Always got a hug and a big smile. She will be missed. Our thoughts and prayers are with all of the family. I hope you cherish all of the wonderful times. God bless all of you.